My neighbor has a 3d printer. For five pounds I bought the files to print a high D Qwistle, and emailed them to my neighbor. Anyway i think it's amazing and cool. Nice work! I have no access to a 3d printer, so I simply bought the Qwistle v2.0. It is a great instrument and mine never clogs. So I guess it might be the material or like you wrote, some sandpaper might fix it. Interestingly very shortly after I posted I broke the whistle trying to get the barrel pieces apart for sanding. I wrote to Mr. Lindsay, the developer, and he responded that it was common that different printers would produce slightly different results, and that sanding the tenons to get a proper fit first was advisable. My neighbor has another one on the way and so I'll try that. I'lll also try smoothing the windway. It's a very interesting technology. It is! My neighbor is printing another one right now, out of a different color material. We'll try sanding it to get a better fit. It takes about seven hours to do the three barrels, which are the largest components. The machine itself is quiet and can be stopped and will resume right where it left off, so the project can survive a power outage. You can change colors at any point, by subbing in a new reel of the material, which is more or less like fishing line. It takes about seven hours to do the three barrels, which are the largest components. Seems to me, since plastic tubes are easy to come by and work with, it would be more practical to print only the whistle head, designing it to fit typical schedule 40 CPVC or PEX pipe. Yes I think that's probably right. what about printing it horizontally so that the grain lines are oriented along the axis instead of perpendicularly? This should reduce the tendency to break, at least from the typical forces a whistle experiences. The tradeoff would be a small amount of warpage, and more trimming/sanding the support structure afterwards. Printing it horizontally I assume would raise issues with how it was attached to the base. My neighbor printed another one, and at this point I'd say aside from the novelty I'm really unimpressed. It took a lot of sanding to get the parts to fit together--I chucked them in a wood lathe, which made it reasonably fast, but dong it by hand would have taken a loooong time. The material itself is fairly fragile and easily broken. I assume that getting a plan that works to the same tight tolerances across a lot of printers, using different materials, would be nearly impossible. There are obviously big differences in 3d printers, with different resolutions and possible materials. I looked at uploading the Qwistle plans to Shapeways and having them print it, but it would have been close to 100 dollars. There are obviously big differences in 3d printers, with different resolutions and possible materials. The whistle I have doesn't sound all that good. The second register is painful and coarse sounding The mouthpiece parts don't fit very well and will need sanding and then gluing up with a gap filling glue. My neighbor is a very capable guy with a lot of attention to detail. It might be some issue with calibration of his machine, or the specific materials. But at this point I need to do a good deal of work to get this where i want it and Generation will sell me a whistle with lots of fun surprise eccentricities for 10 bucks. For 100 dollar you could just buy the Qwistle v2.0 directly from Donald Lindsay. Mine is pretty nice. The sound is very clear, it doesn't clog, the finish is smooth. 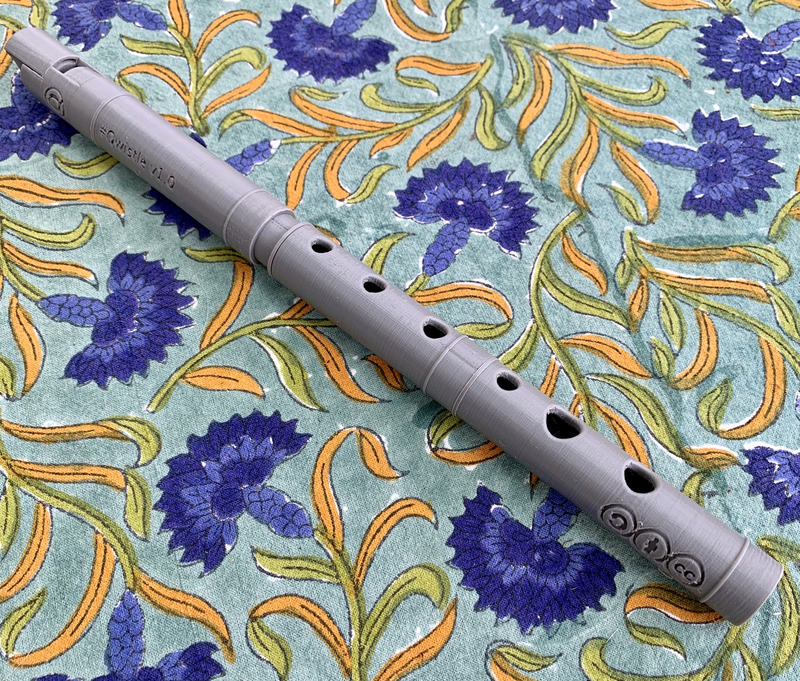 It is printed from some type of nylon that is also used to recreate vintage recorders and other wind instruments (at least that's what is says on the homepage). The only "negative" aspect -- it sounds almost too pure, not like a traditional tin whistle. My wife doesn't like it, she thinks it's too shrill in the 2nd octave. What would you estimate is the cost of materials when 3D printing this at home?